In 2000 a beheaded journalist was found in a remote forest near Kyiv. The corpse led to a scandal when it was revealed that it was that of a journalist critical of the authorities. The President was heard on tapes, made covertly in his office, ordering violence to be undertaken against the journalist. The scandal led to the creation of a wide protest movement that culminated in the victory of democratic opposition parties in 2002. The democratic opposition, led by its presidential candidate Viktor Yushchenko, fought a bitter and fraudulent election campaign in 2004 during which he was poisoned. Widespread election fraud led to Europe’s largest protest movement since the Cold War which became known as the Orange Revolution, known after the campaign colour of the democratic opposition. 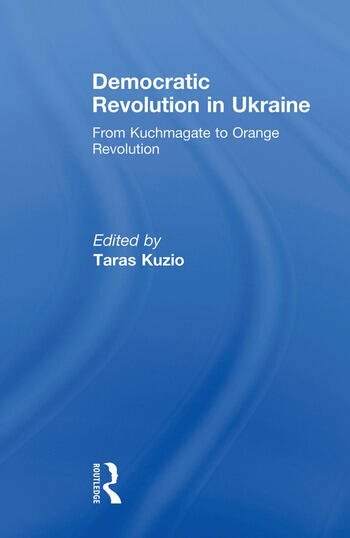 This book is the first to provide a collection of studies surveying different aspects of the rise of the Ukraine’s democratic opposition from marginalization, to protest against presidential abuse of office and culminating in the Orange Revolution. It integrates the Kuchmagate crisis of 2000-2001 with that of the Orange Revolution four years later providing a rich, detailed and original study of the origins of the Orange Revolution. This book was published as a special issue of the Journal of Communist Studies and Transition Politics. Taras Kuzio currently teaches at the Institute of European, Russian and Eurasian Studies at Carleton University, Ottawa. He was a Visiting Professor at George Washington University, Adjunct Professor at the Department of Political Science, University of Toronto, and a Senior Research Fellow at the Centre for Russian & East European Studies, University of Birmingham. In these posts, he has taught on contemporary Ukrainian politics, nationalism, democratic revolutions, European Union politics and Trans-Atlantic Security. He was also Head of Mission at the NATO Information Office in Kyiv.